I am pleased to announce the introduction of the Trident II. The Trident II represents our continuing commitment to produce a state of the art 1911 style pistol that will function in any environment that may be encountered anywhere in the world. The original Trident pistol was built utilizing the Springfield Armory 1911A1 pistol as the base platform to build on. These pistols proved to be excellent performers. However, Springfield Armory has encountered the huge increase in business that all quality firearms manufacturers have. This increase in sales has severely limited the availability of their 1911A1 pistol. This limited availability has hampered our delivery of Trident pistols. We have decided to produce the Trident on our own slides and frames that we have been using in the building of our full custom 1911 pistols. This has allowed us to offer several new features and thus the new Trident II. The Trident II will be offered in 3 different platforms. The Trident II-A1 will be a 5” government model with a tactical integral magazine well. The Trident II-A2 will be a 5” government model with a tactical integral magazine well and an integral Picitinny equipment rail on the bottom of the dust cover. The Trident II-A3 will be a 4 3/4” Commander model without the magazine well or equipment rail. The Trident II-A3 is designed for concealed carry so anything that adds size was deleted. The overall quality of the Trident II has also been improved. The slides and frames are manufactured here in the US as well as all of the other parts that are in the pistol. We are using all C&S parts to manufacture the pistol. All critical internal parts are cnc machined billet steel or made from forgings and heat treated throughout. Every part is checked on our Rockwell testing machine to be sure that it meets our specifications for the proper heat treatment. Each pistol is hand built one at a time by one pistolsmith. The Nickel Boron finish has also been improved. We have found a company that applies the Nickel Boron finish to a much higher standard of quality control that the previous company that we were using. The finish thickness is extremely even. We were having problems with too much thickness in some areas and too little thickness in others with the earlier company. The new finish is also very uniform in the color and not so blotchy as before. We have had to increase the price on the Trident II because of the improvements that we have made. I feel that the value of the Trident II has been increased far more than the actual increase in price. 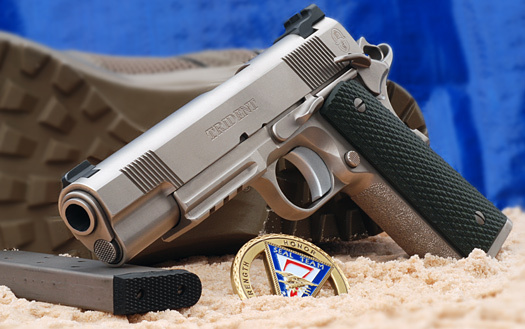 For those of you who need a 1911 pistol designed with this ultimate level of quality and reliability, I know that the Trident II will meet all of your requirements. Thank You for your interest in the Trident II. Bill Laughridge, President, Cylinder & Slide Inc.